The key indicator of soil quality is Organic matter. Organic matter improves the water-holding capacity of sandy soils and helps drainage in thick soils. Organic Matter reduces the risk of soil slumping, capping and erosion. Maintenance of soil organic matter increases biological activity from earthworms and fungi to micro-organisms and helps to maintain soil fertility. How can quality compost benefit cereal crops ? Helps maintain and enhance soil organic matter levels. Improves soil water holding capacity and workability. Supplies crop-available nutrients and trace elements. Can help improve crop establishment and long-term yields. 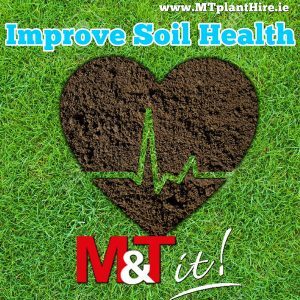 Regular use of compost will help to maintain and enhance soil organic matter levels and will be of particular value for cereal crops grown on lighter soils in drier parts of Ireland.